Home Secretary Theresa May says economic migrants rescued in the Mediterranean Sea will not be taken in by the UK and should be forcibly returned to avoid encouraging others to take the risk of traveling to Europe. “I disagree with the suggestion by the EU’s high representative Federica Mogherini that ‘no migrants’ intercepted at sea should be ‘sent back against their will,’” May writes in the Times. With this she also confirmed that Britain would not participate in a mandatory resettlement or relocation scheme. “We cannot do anything which encourages more people to make these perilous journeys – or which makes it easier for the gangs responsible for their misery. “That is why the UK will not participate in a mandatory system of resettlement or relocation. “We must not provide new incentives for those simply seeking to come for economic reasons,” she added. May said there is a difference between people fleeing persecution and economic migrants crossing the Mediterranean in the hope of a better life. The latter group, she says, should be sent back to their country of origin – even if against their will. 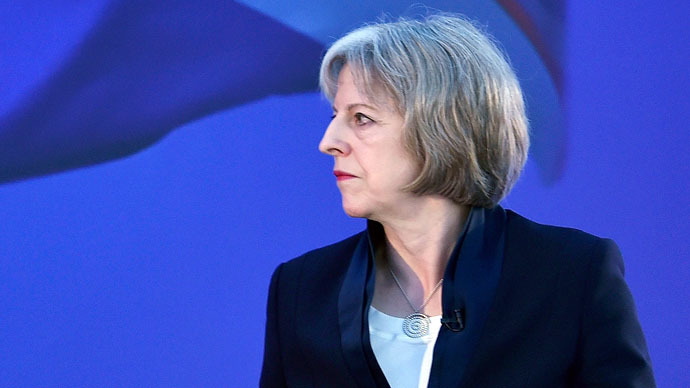 May warned the migrant crisis is worsening and demands a “clear response” from European nations. “Gangs are profiting from the misery of their fellow humans, selling them false promises before loading them on to dangerous vessels and sending them – in many cases – to their deaths,” she wrote. She proposes establishing safe landing sites in North Africa, an active program of returns and a “properly structured program,” which slowed people traveling through transit countries. Around 60,000 people have already tried to cross the Mediterranean from North Africa this year, according to the UN. More than 1,800 migrants have died attempting the journey. European Commission President Jean-Claude Juncker is expected to propose new quotas for asylum seekers across the European Union on Wednesday. He is expected to present a new system, which would allocate migrants to different EU member states according to their GDP, population and past numbers on asylum acceptances. Germany, France and Italy are strong supporters of the scheme, and have taken in tens of thousands of refugees, while some Eastern European countries, which have taken in only a few hundred, oppose it. The UK government earlier announced that it would use its opt-out option. On Tuesday, the EU Commission agreed the UK can have the right to not take part in the scheme. Denmark and Ireland are also not bound by it. May told ITV1's Good Morning Britain on Wednesday the real problem are the smugglers. She said more needed to be done to stop people traffickers. “The real way to deal with that flow of people – a lot of which is to do with economic migrants, people from countries like Eritrea and Nigeria – is actually to stop that flow of people in the first place. Meanwhile, the UK has deployed the warship HMS Bulwark and search and rescue helicopters to the waters between Libya and Italy. The Royal Navy ship has already rescued more than 600 people in a single week. In the warship’s biggest rescue since it began patrolling the sea, its crew saved the lives of 400 people, including children and pregnant women, 40 miles off the Libyan coast. “HMS Bulwark and her crew have already proved an invaluable asset in assisting with the Mediterranean migrant crisis,” Defence Secretary Michael Fallon said.